Hi and welcome to my home! 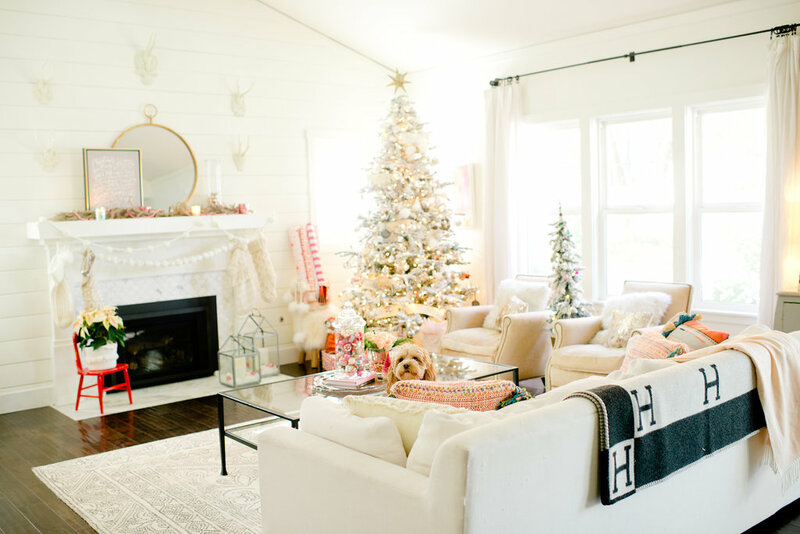 Christmas is my absolute favorite time of year to decorate. I know, I know…you’ve heard that one before. But, it’s true! 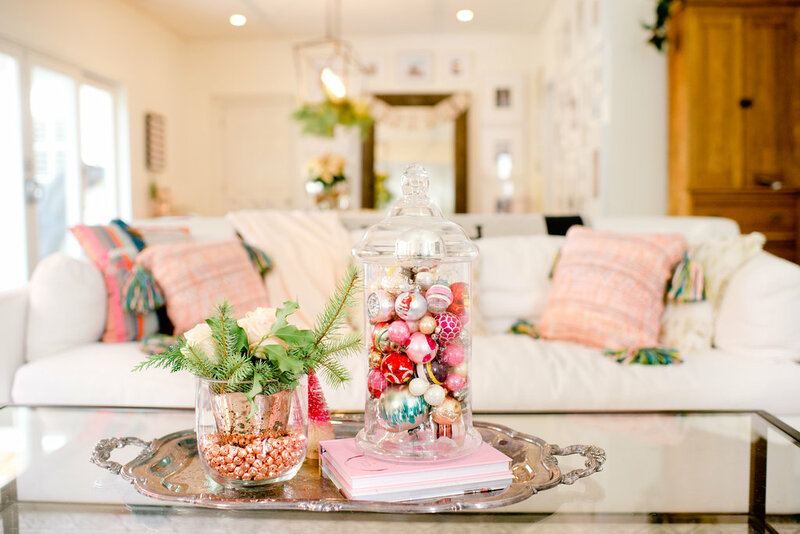 I start planning my holiday decor months in advance and the anticipation is sometimes just too much for me! This year I decided to stay true to my style. 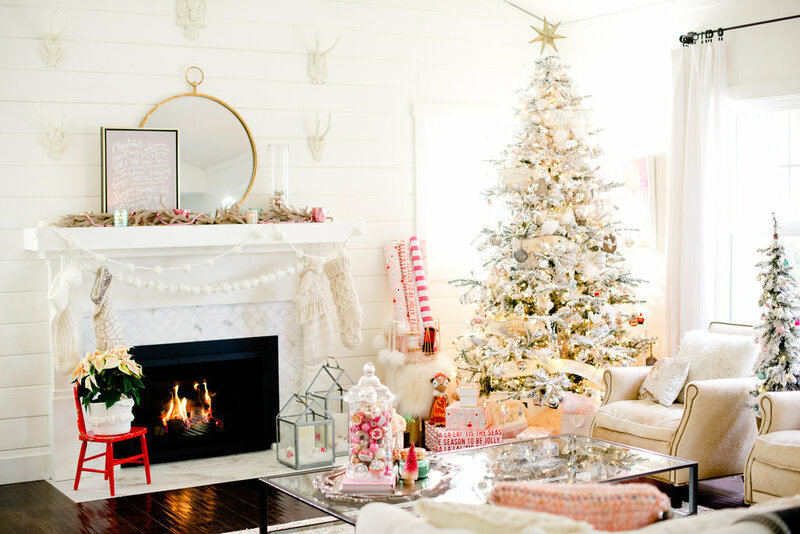 And I love a good vintage inspired Christmas. 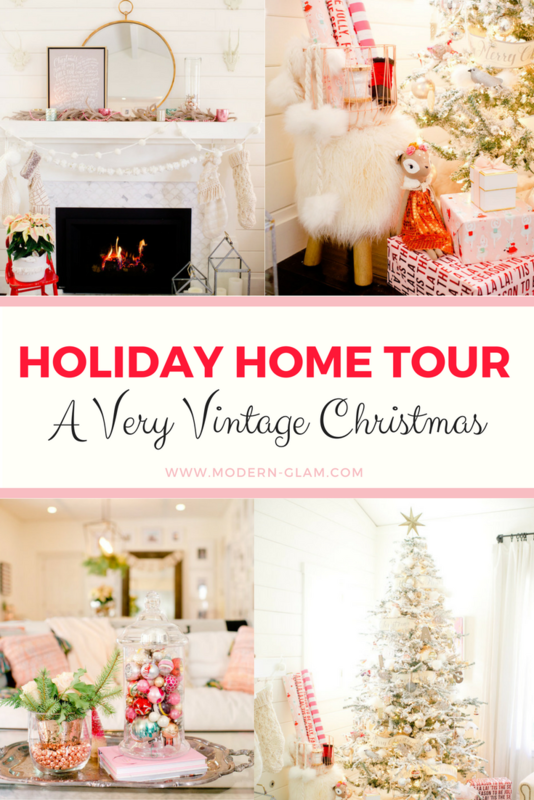 So come on in and let me know show you my Holiday Home Tour: A Very Vintage Christmas – Part 1! If you want to see part 2, click here! I have been collecting bottlebrush trees for over 10 years now. I have acquired quite the forest of brightly colored trees! The thing about these cuties, is that they can go with any style. 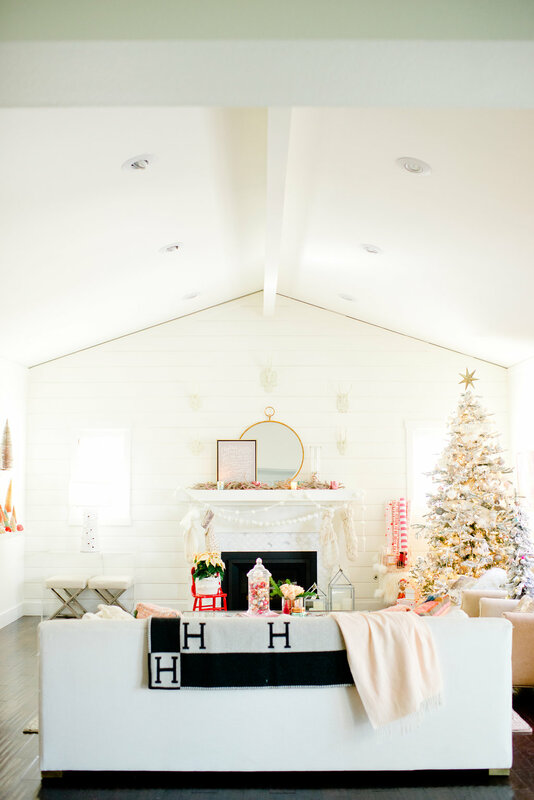 My personal style has evolved over the years and somehow these trees go with my decor every single year. Arranging them is no easy feat. 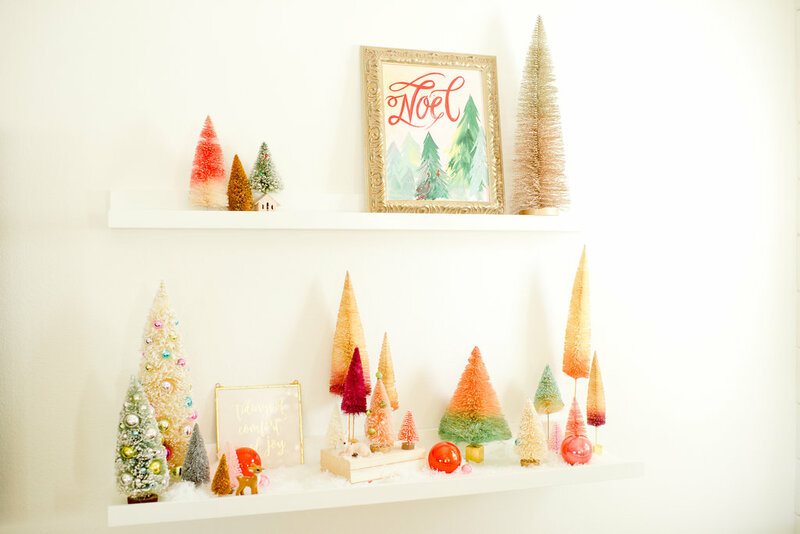 I used some old books to create different levels for them and added in some vintage ornaments and faux snow. I also love my Lindsay Letters art, of course! This little forest of trees set the tone for the rest of my living room decor. 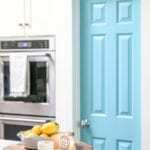 Bright, cheerful with a vintage twist! It seems like each winter the gathering spot in my home is the fireplace. And so naturally, I shift my furniture to face this spot! 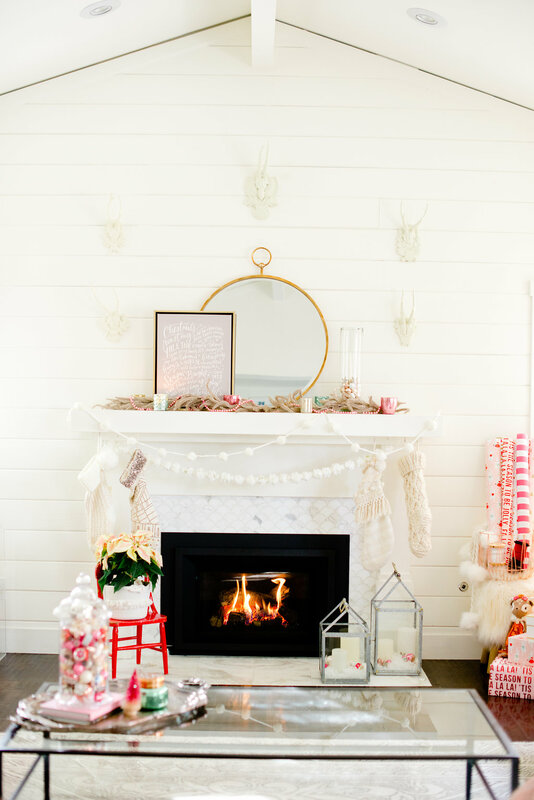 I love cozying up to the fire at night and playing games with the kids or wrapping presents. 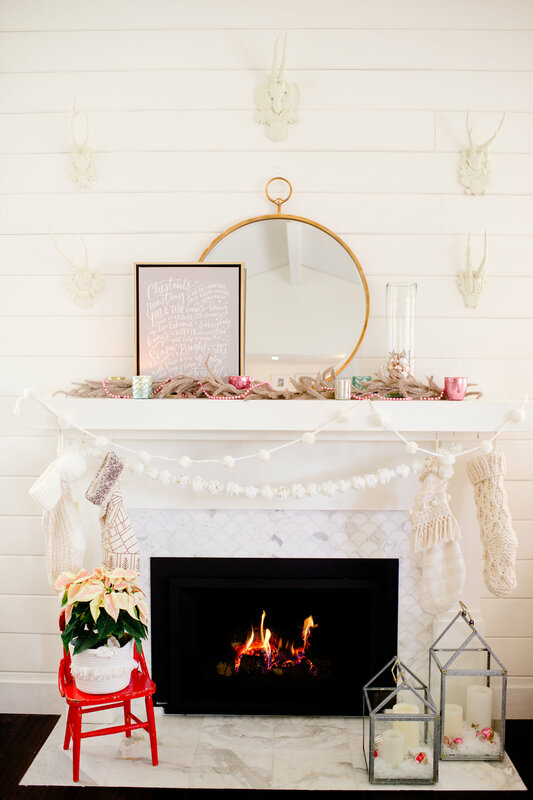 I recently got these faux antlers from Ballard Designs and I love the way they set the tone for a neutral winter scene. By bringing in my son’s vintage red school chair, I added a pop of color that I played off of with my wrapping paper. 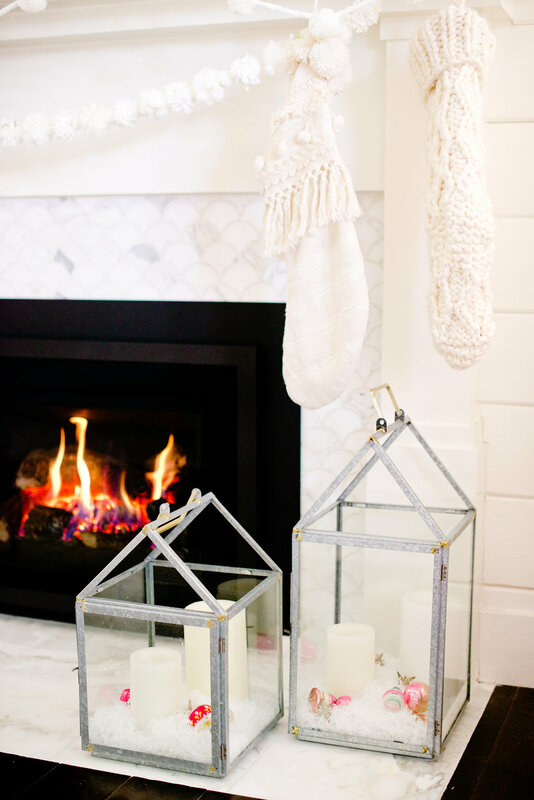 And I love the lanterns from the new Magnolia Hearth and Hand line at Target. I filled them with some snow and vintage ornaments. 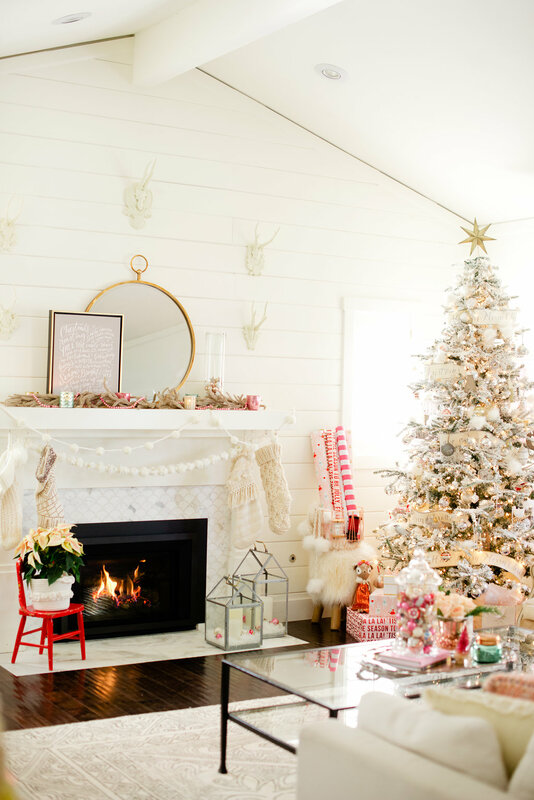 Some chunky knit stockings and pom pom garlands add texture and interest without visually cluttering the space with more color. I found these stockings at Anthropologie and I love their vintage vibe! 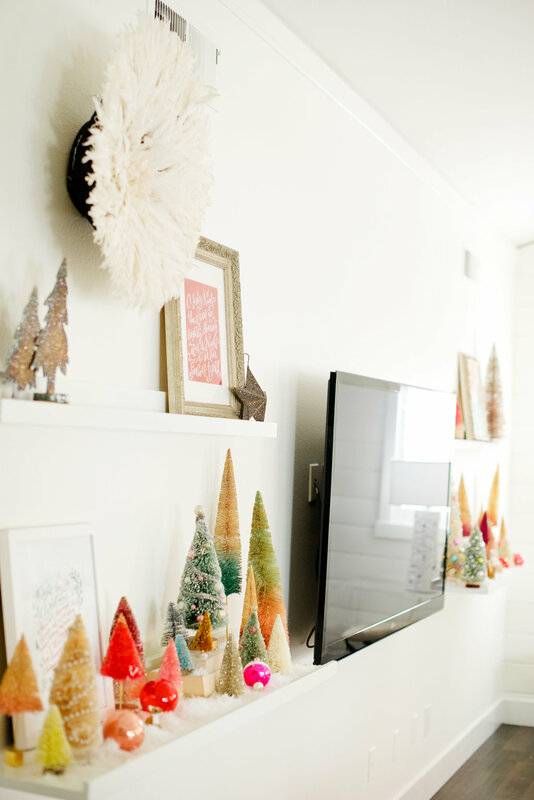 Some people like to do a theme for their tree and I love that idea! But I tend to use the same ornaments year after year. Maybe adding in a few new ornaments each year. 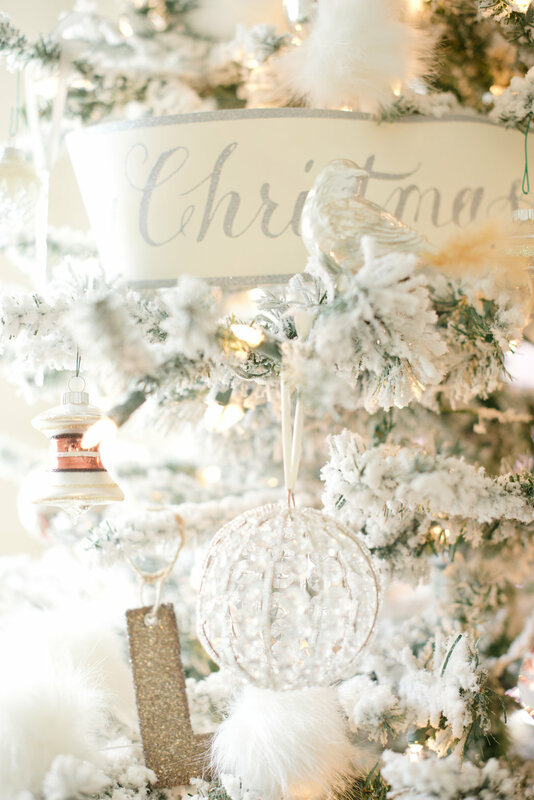 I have been collecting these ornaments for 20 years now and they seem to have a theme – neutral and vintage inspired! 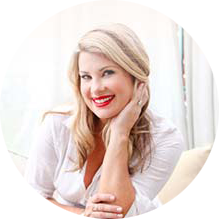 My kids think I’m sooo boring but I love the metallics – golds, silvers, and copper. And I will tell you that it saves me from having to buy new ornaments when each fad passes. 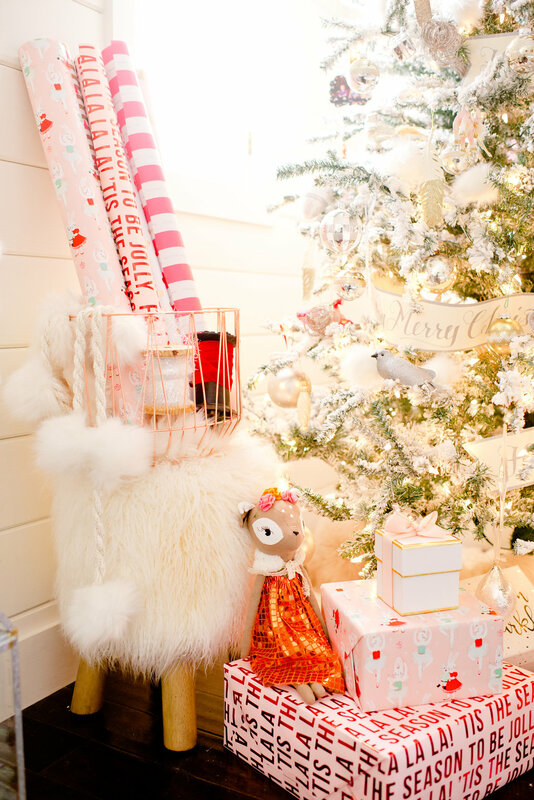 My tree is a great flocked tree from Vickerman. I love the realistic looking branches and the crazy amount of flocking that it has. It truly looks like it was a victim of a huge snowstorm! I have a great collection of vintage ornaments that I have been saving for years. And I like to display those in a large glass jar on my coffee table. They are also sprinkled around on the mantel, shelves and in my lanterns. 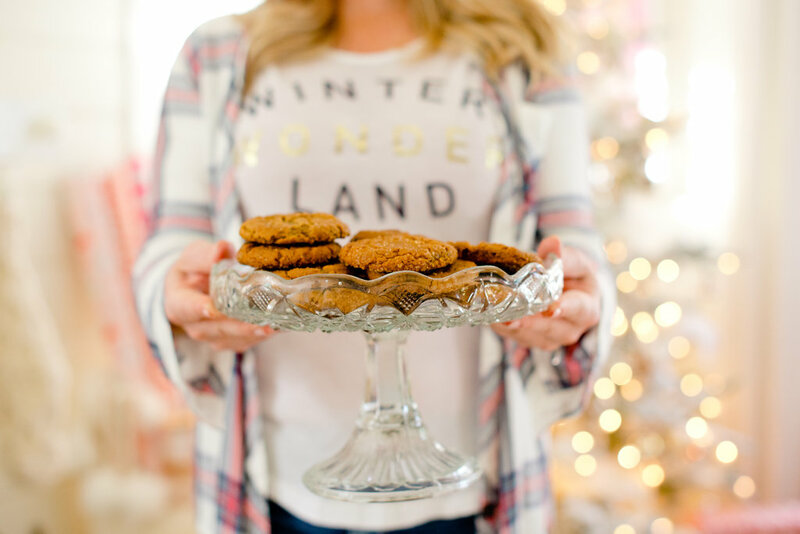 There is something so special about these old ornaments with so much history! To simplify the hectic holidays, I created this little wrapping station right next to the fireplace. So at night after the kids have gone to bed I can wrap presents while keeping cozy warm and maybe watching a Christmas movie or two! Everything I need is in the basket and I can just put the present right under the tree when finished. I added a small flocked tree in-between my two chairs and I love how it adds to the overall magical vibe. The tree has battery operated lights that are on a timer and it’s perfect how they come on and go off all on their own! 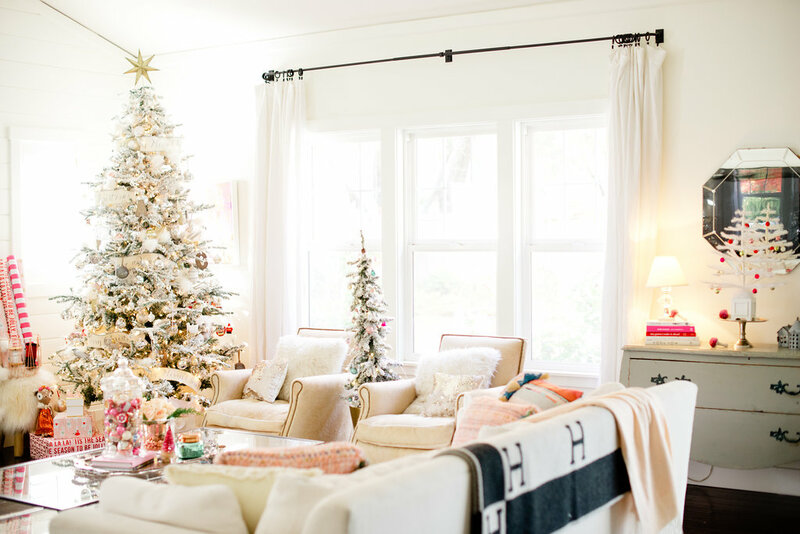 This little tree is sprinkled with vintage-inspired ornaments from Anthropologie and is perfect for this quaint spot. 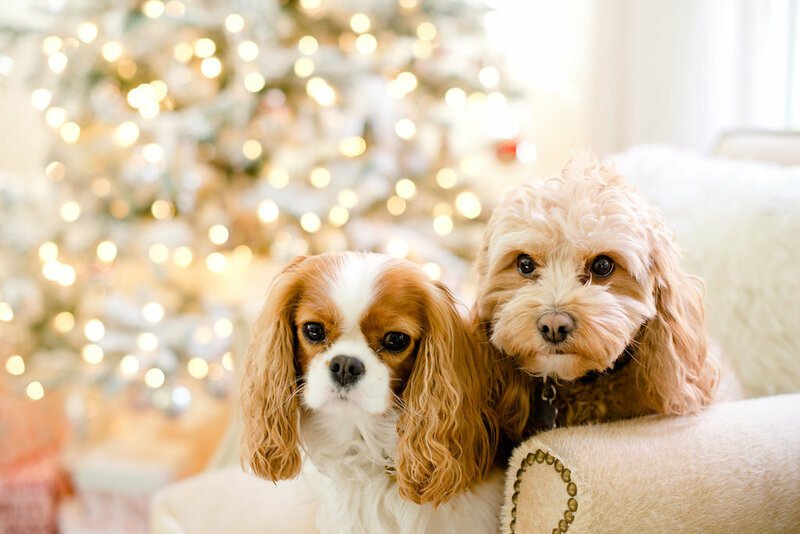 And these little cute furry friends were the perfect models while we were taking pics. They just didn’t want to be left out! 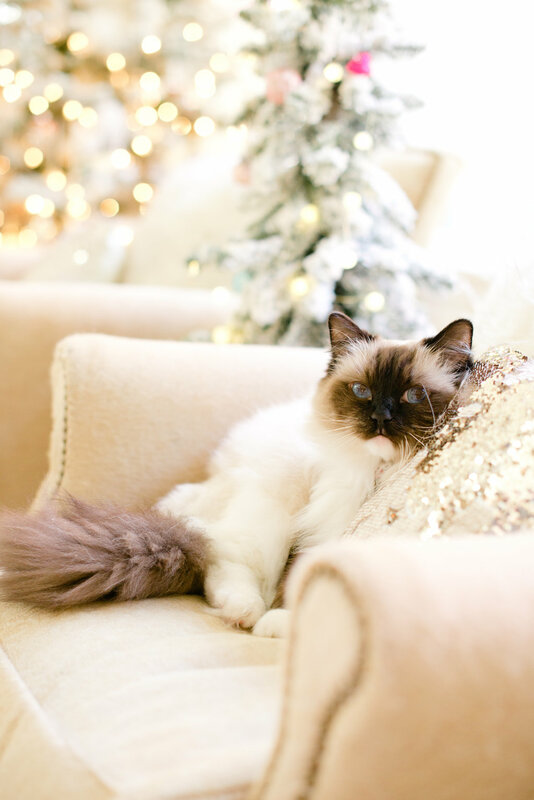 I’m so happy that you stopped by to see the first part of my Holiday Home Tour! 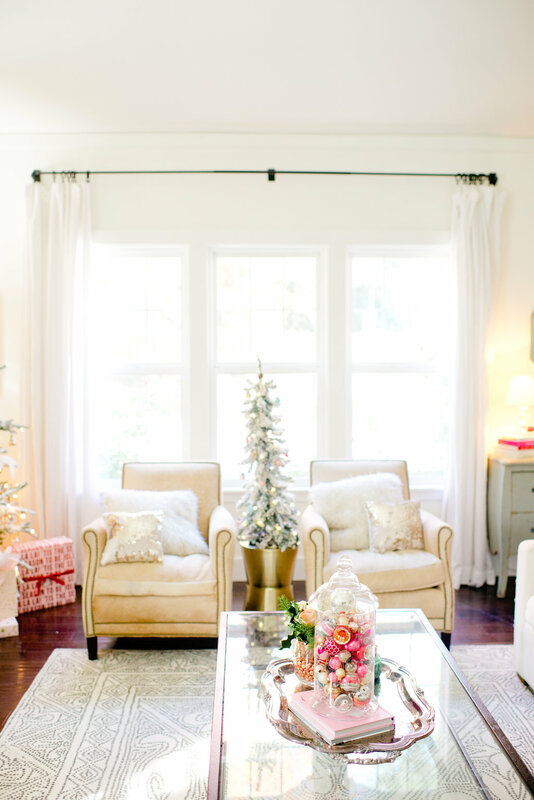 Be sure to check back tomorrow so I can show you around the rest of my house all decked out for the holidays! 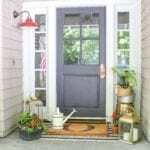 I will be showing you my kitchen, entryway, front porch and bedroom! So so lovely Ashley! I love the colored trees! 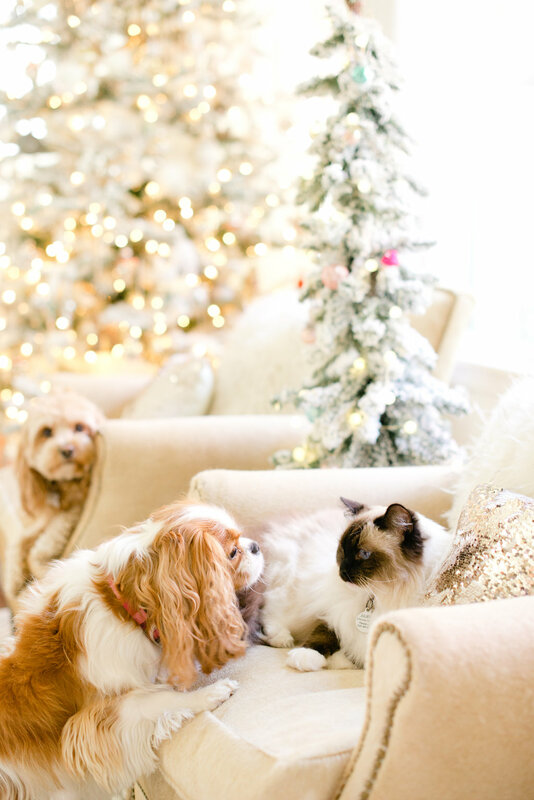 Oh my goodness, I adore it all so much!! Love the vintage flair mixed in with everyday modern. The bottle nose trees are just splendid! Thank you so much Martha! 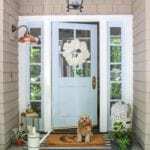 I loved “visiting” your home too – so many special and beautiful touches you added! ashley I am obsessed with your colorful pink pops. The bottle brush tree collection is my fav. 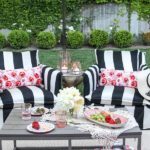 What a beautiful home you have ashley! 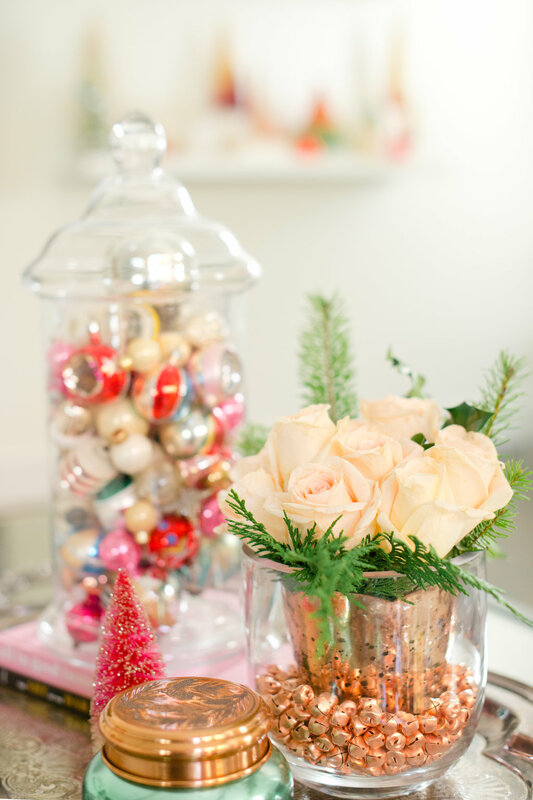 love all the special vintage touches and the soft, pretty colors! Ashley, So Beautiful!!!! 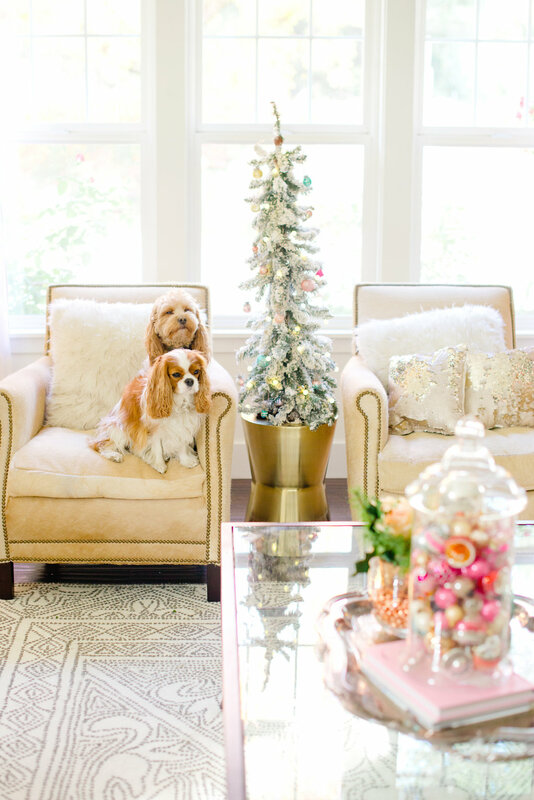 I love your gorgeous christmas style! your collection of trees are so pretty. Ashley, I’m freaking out! So beautiful! I can’t believe how it all came together! it’s totally breathtaking. 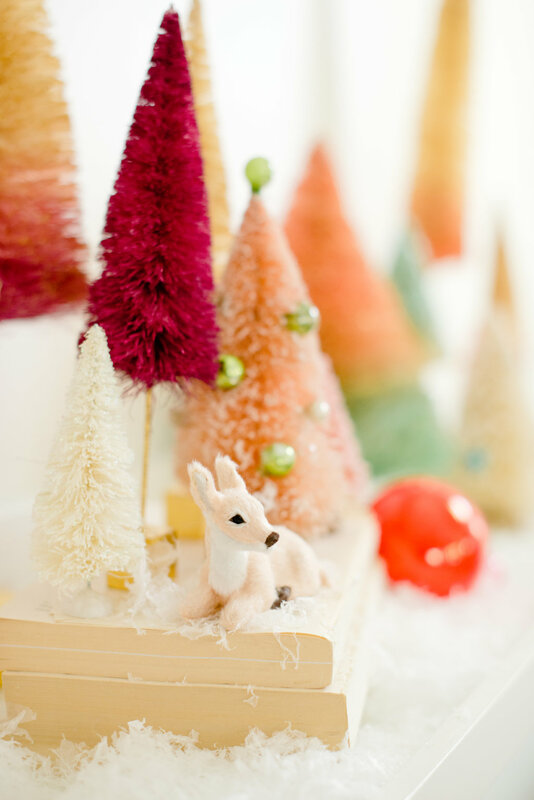 I especially love your collection of vintage bottle brush trees and ornaments. I need to go treasure hunting with you!! Oh you are too sweet!!! And yes to treasure hunting! Anytime! Wow, your tour is so beautiful. I’m a fan of our fireplace area, but the whole space is amazing! Ashley, you have truly created magic! 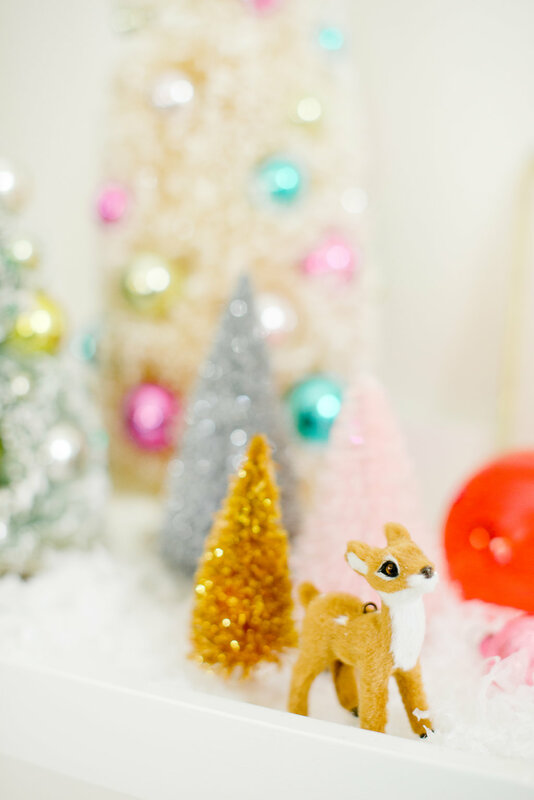 Thise vintage trees and little reindeer are the cutest things! 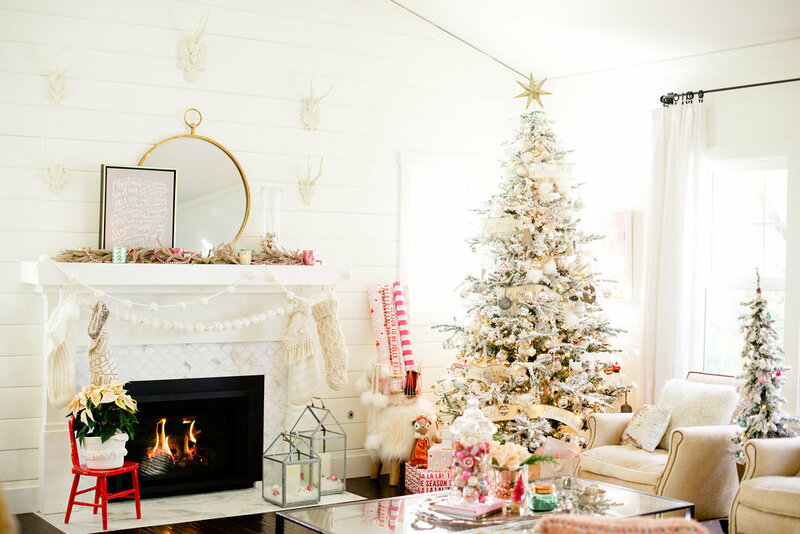 Your tree is so gorgeous and I love your whimsical fireplace! Merry Christmas my friend! Thank you Summer! I had so much fun putting this together this year! Ashley, where is the pink and red fa la la la la wrapping paper from? I absolutely love it, and it matches my theme perfectly! Hi colleen! I got the wrapping paper at Home Goods this year. I have had no luck finding it online unfortunately! 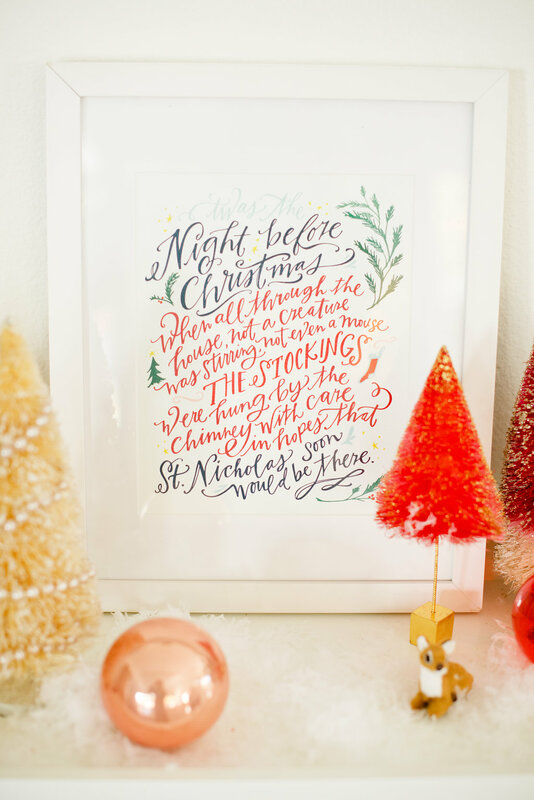 It is by Meri Meri and says “Tis the Season. Fa La La La”. Hope that helps – and good luck!